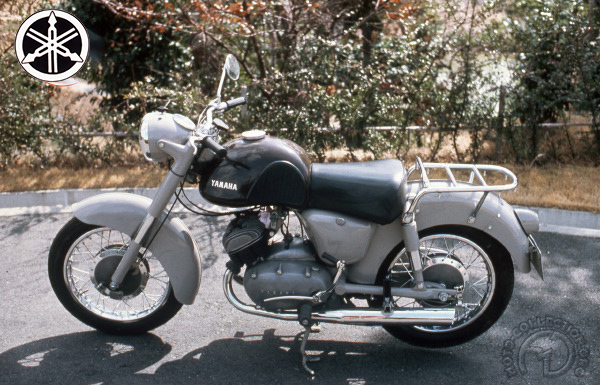 The Yamaha YD1 is a Japanese made touring motorcycle built in 1957. It has two stroke twin 250 cc engine; with a top speed of 71 mph (114.3 km/h). "Yamaha, the youngest of the "Big Four" Japanese motorcycle manufacturers, didn't build its first two-wheeler until 1954, when it unveiled a copy of the DKW RT 125, calling it the YA1. This spidery autocycle was a great success. It won handily the first cindertrack hillclimb ever held at Mount Asama, north of Tokyo, in both 125 and 250cc classes. It was a decisive moment for Yamaha. But Yamaha's competitors were not standing still, so in 1957 Yamaha launched a new 250cc model, this time based on the Adler MB 250. The new bike's main difference was in its frame, which was a pressed steel copy of the German Adler's cradle frame. Maybe that wasn't such a good idea! The first racing versions of the 250 YD1, seen at Mount Asama in 1957 and in the Catalina United States Grand Prix in 1958, went back to the original German cradle design! Yamaha was a fast learner and, within a few years, its twin had cast off all traces of its origins and had given rise to a motorcycle dynasty. The first was the electric-start YD2. Then came the first dedicated sports models, the YDS1 and the YDS2 (the first model exported to Europe). Yamaha competed in its first French GP at Clermont Ferrand in 1961 and returned in 1963 with a succession of famous riders - Vesco, Read, Redman, Ivy, Saarinen, and Agostini.